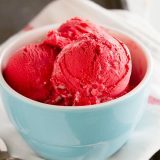 Red velvet goes frozen in this rich and creamy Red Velvet Ice Cream with Marshmallow Swirl. This ice cream recipe is super easy and perfect for anyone who loves homemade ice cream! Combine the cream cheese, half and half, sugar, buttermilk, food coloring, cocoa powder and salt in a blender and process until smooth. Cover and chill for at least 2 hours, but preferably overnight. Pour the mixture into an ice cream maker and freeze according to manufacturers directions. Spoon some of the ice cream into a freezer safe container, followed by some of the marshmallow topping. Continue to do this until all of the ice cream and topping are added to the container. Freeze until the ice cream has hardened, overnight if possible. Serve with additional marshmallow topping, if desired.